In the study, Professor Lee fabricated silicon wafers with cylindrical cavities of different geometries. After immersing them in bulk water, they observed the details of, and the rates associated with, water penetration into the cavities from the bulk, using bright-field and confocal fluorescence microscopy. Cylindrical cavities are like skin pores with narrow entrance and specious interior. The cavity filling generally progresses when bulk water is spread above a hydrophilic, reentrant cavity. 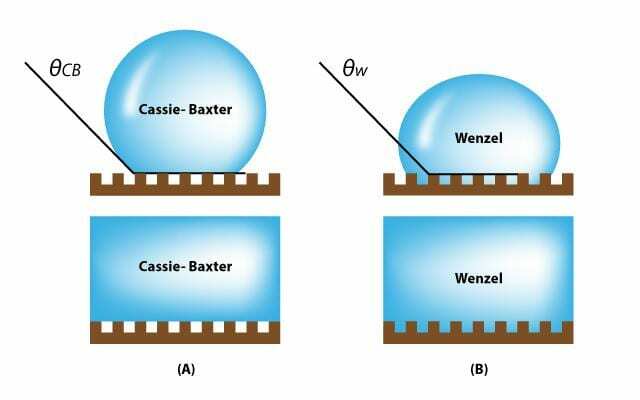 As described in "Wetting Transition from the Cassie-Baxter State to Wenzel State", the liquid droplet that sits on top of the textured surface with trapped air underneath will be completely absorbed by the rough surface cavities. "Our results can used in the manufacture of special-purpose cosmetic products," says Professor Lee. "For instance, pore minimizing face primers and facial cleansers that remove sebum need to reduce the amount of dissolved air, so that they can penetrate into the pores quickly." Dongjin Seo et al., "Rates of cavity filling by liquids," PNAS (2018).